Tape the bottom of the box first with two pieces of tape, taping along the join only and down the sides. 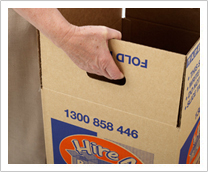 When the box is full, fold over the flaps and tape along the join. Write on the tape only with a permanent marking pen Don’t write on the box. The next person to use the box will cover up your tape and then they can write on their tape. This prevents confusion of what’s in the box when delivering and into what room the box should go. Beware – tapes are not all the same. 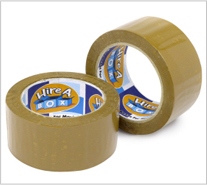 There are a huge number of inferior tapes in the market which have poor adhesive qualities and may cause the box to become unstuck during transportation. We also offer professional-grade tape dispensers for quick and stress-free taping of the boxes which can be hired or bought separately.